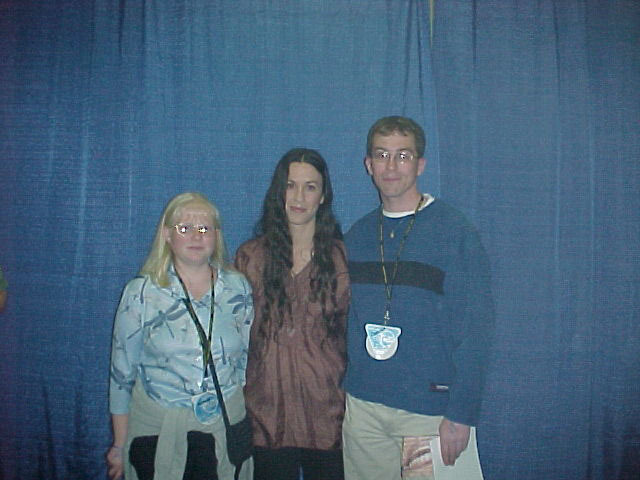 Here is a picture of Angela and me with Alanis. I originally wrote this review for Canoe. Thank you Canoe for the free tickets and giving me the opportunity to meet Alanis. And that concludes the second to the last stop on Alanis Morissettes' Supposed Former Infatuation Junkie tour. Oh! I suppose you would like to know a bit more about it then that. Well let me fill you in on what happened tonight. Joining me tonight for the excitement was my girlfriend Angela. Stunning performances by all three bands. Thrush Hermit, a band originally from the Maritimes kicked things off with some rocking tunes. Gotta love those guitar riffs. Two of the band members got into a bit of a musical banter as they took turns showing off their ability to play with their teeth. A bigger thrill then that was seeing the Crash Test Dummies perform live in the flesh. I have been a long time fan ever since the Superman Song. I am very impressed with their new album. What a big difference from there old sound! Their new album is getting heavy air play on my radio show at Campus Radio Saint John, at the Saint John Campus of the University of New Brunswick. We didn't get to see too much of the Dummies because that is when we got to slip back stage to meet Alanis. It was just a quick hello, this is who I am, it's a pleasure to meet you, can I have you autograph and would you be so kind as to pose for a picture. She was really very pleasant and friendly. Then the excitement really began. The crowd was getting really restless. They got so anxious that they were doing the wave while they waited. You could really tell that we were in a hockey rink then. When she came out on stage I was right up in front of the stage snapping photos like crazy. To be so close while she was on stage was such a rush. Looking back at everyone in their seats I knew that they all wanted to be where I was. Things really began to cook when she started into Hand in My Pocket. By the time she got to All I Really Want you could feel the intensity of the vibrations from the speakers. That lead right into You Oughta Know which had everyone singing along. I could list every song she sang and the impact it left but that would take to long. She did sing Uninvited, which was suitable, because one guy who was uninvited thought he would jump up on stage and dance. Security quickly escorted him off before he did anything he would be sorry about later. This will be one night that I won't forget. To be able to meet an icon like Alanis in person was such a treat. In the fall I will get an opportunity to meet many more talented Canadian musicians, as I will have a Canadian musician be my guest every Friday on my radio show. The next time Alanis is back in town I will have to get her on. As Alanis would say... Thank You CANOE for giving me this wonderful opportunity. More Pictures from the concert.